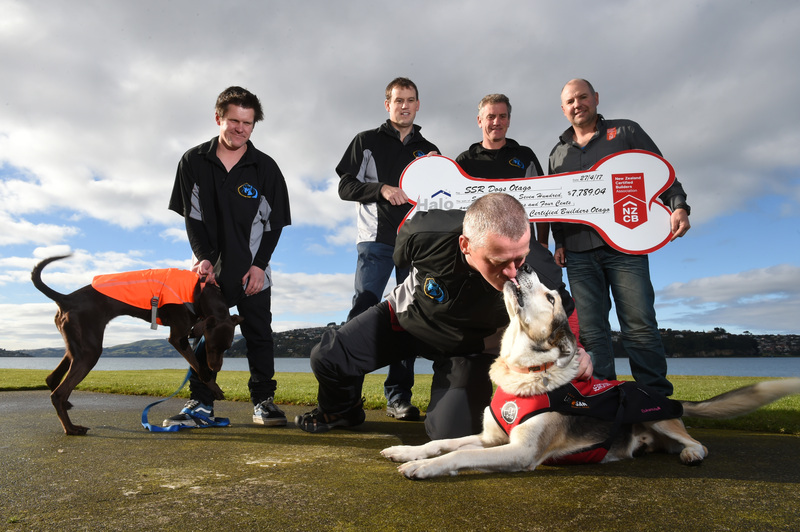 Dermot Mayock gets some love from search and rescue dog Fin as New Zealand Certified Builders Otago president Sacha Gray (right) hands over a cheque to Search and Rescue Dogs Otago team members (from left) Moose, Richard Warrington, Wayne Miller and Barry Dougherty. Photo: Gregor Richardson. For Otago search and rescue dogs, life just got a little bit better. New Zealand Certified Builders (NZCB) Otago has raised $7789.04 for Search and Rescue Dogs Otago which is dedicated to rescuing those lost around the region. NZCB Otago president Sacha Gray said the local community organisation did not receive any direct funding and its volunteers paid for their own tracking gear for both themselves and their rescue dogs. The money was raised during the recent NZCB Otago annual golf tournament, meal and auction. "Search and Rescue Dogs Otago doesn’t get any funding from the Government or anybody else. "A lot of these guys have to cough up all the money out of their own pockets so they can go away and do training and buy the gear for their dogs. "And another reason we did this is because a lot of us builders are into hunting and fishing and a bit of outdoors stuff, and we realise the importance of what these guys do. "You never know when you might need their help." Search and Rescue Dogs Otago president Barry Dougherty said being an SAR volunteer was a costly exercise. "We all volunteer our own time and it costs thousands of dollars a year on training and operationals." Members were "over the moon" to be chosen to receive the funding. "We will look at purchasing some equipment with it — wet-weather gear, collars, stuff that gives us more ability to go out and look for missing people."